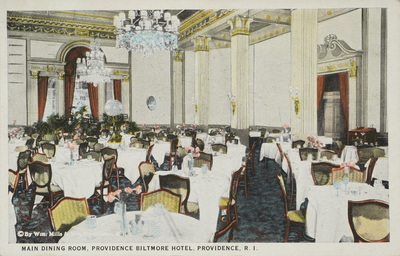 Main Dining Room, Providence Biltmore Hotel, Providence, R. I. Used. Postmark: November 5, 1923. C. T. American Art, Chicago, "Main Dining Room, Providence Biltmore Hotel, Providence, R. I." (1923). Rhode Island Postcards. 165.